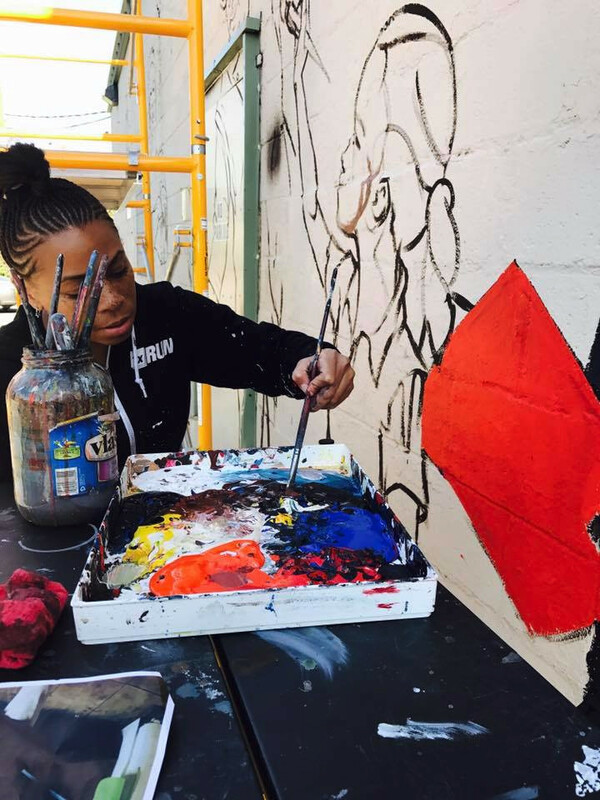 Seven local artists will begin painting murals in collaboration with six small local businesses across Detroit to help activate the neighborhoods and celebrate the city’s entrepreneurship culture. 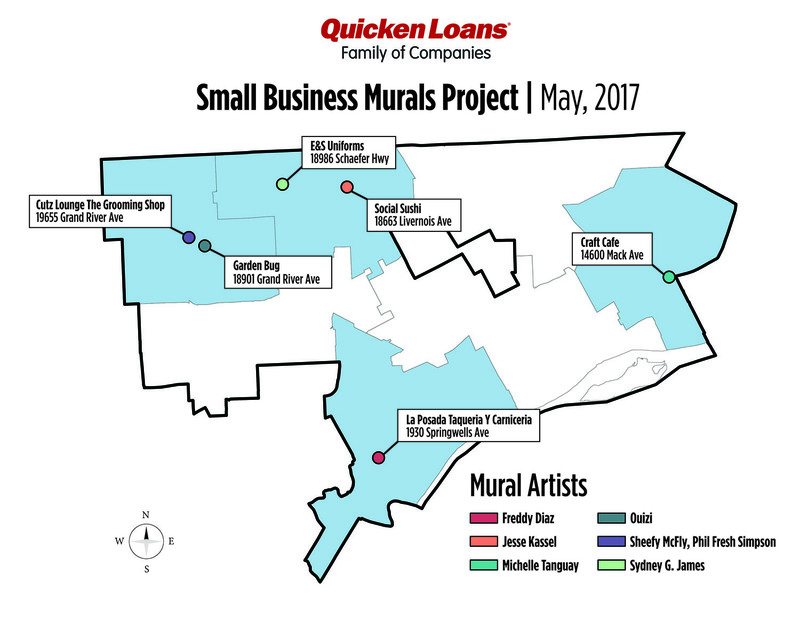 The Small Business Murals Project is a partnership between the Quicken Loans Family of Companies and 1xRUN, local publisher of fine art editions and producer of the Murals in the Market program at Eastern Market. 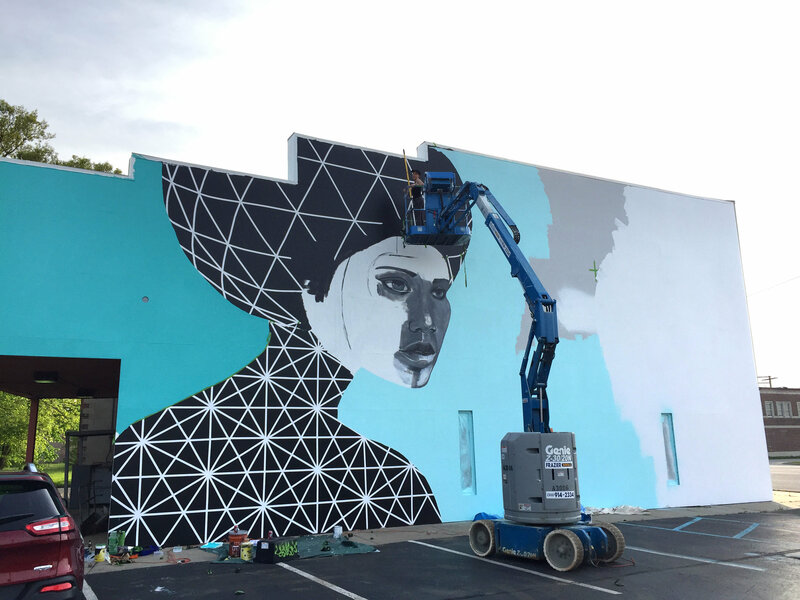 All six murals are scheduled to be complete by Sunday, May 21. This project finishes up just as Startup Week begins in Detroit, during which Quicken Loans and WeWork will invest $2.5 million in Detroit entrepreneurs on Quicken Loans Detroit Demo Day, May 25, 2017, at the Gem Theatre. All of the entrepreneurs joining in the Small Business Murals project are graduates of local entrepreneurial training/development programs: BUILD Institute, Lifeline, and ProsperUs. Quicken Loans is a funder for each of these programs. Participating businesses are Cutz Lounge,The Grooming Shop and Garden Bug in Rosedale Park, Social Sushi, E&S Uniforms and Apparel in University District, La Posada Taqueria Y Carniceria in Springwells Village, and Craft Café in Jefferson Chalmers. For each of the six murals, the entrepreneur and artist have collaborated on the design for their mural, making each painting unique and representative of the flavor and character of the business and neighborhood as well as the artist’s unique style. Four of the six works were designed to allow for multiple painters to work on each mural. On Friday, May 19 and Saturday, May 20 more than 150 volunteers from the Quicken Loans Family of Companies will follow the artist’s instructions for filling in these three murals. Read on below for a complete list of mural locations and artists. The team at The Small Business Murals Project tapped Eastern Market based 1xRUN to curate and produce the six murals for this city wide project. The world’s leading publisher of fine art editions, 1xRUN and their veteran team have championed Detroit’s public art scene for nearly a decade. 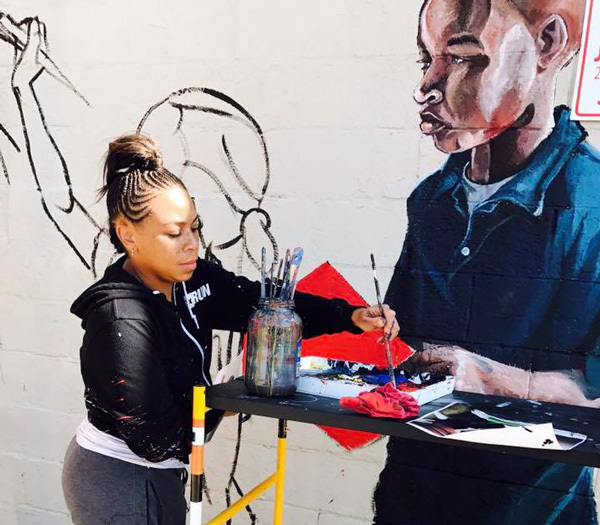 Their annual arts and culture festival Murals In The Market is also entering its third year this September, partnering with the Eastern Market Corporation and the John S. and James L. Knight Foundation to present dozens of permanent murals throughout the Eastern Market district. Over the past five years 1xRUN, along the company’s fine art gallery Inner State, have curated and produced more than 100 murals in Eastern Market alone, with more than 150 murals throughout the City of Detroit. Michelle Tanguay mural in progress for Quicken Loans Small Business Murals at Craft Cafe. Freddy Diaz – Diaz was recently commissioned by the Lear Corporation to create a unique mural painted inside their new Innovation Center in Detroit’s Capitol Park. Jesse Kassel – National burger chain Shake Shack commissioned a permanent piece for the opening of their new downtown Detroit location. Sydney G. James – Recently commissioned by Under Armour to paint Justin Verlander in the new Brand House on Woodward. Ouizi – Detroiters may know her work best from the Flower House project in partnership with Pot+Box, and her mural at Astro Coffee. Phil Fresh Simpson – Founder of The Smile Brand, a streetwear and lifestyle brand dedicated to the life of smiling and spreading joy. Michelle Tanguay – Michelle’s “Lollipop Building” murals adorn vacant street-level windows on the corner of Michigan Avenue and Washington Boulevard.